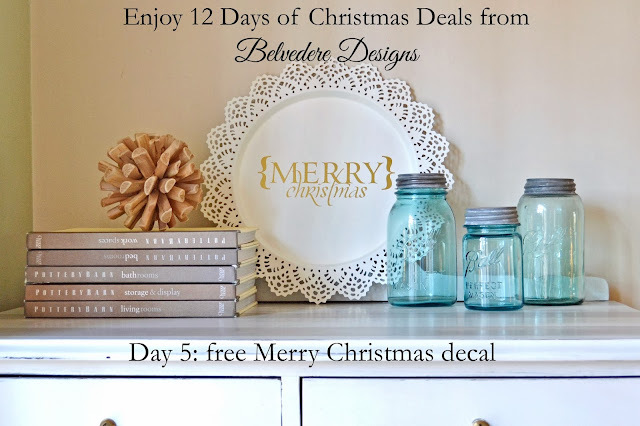 It's Day 5 of our 12 Days of Christmas promotion, and, today only, receive a free Merry Christmas decal with any purchase! I am totally in love with this decal-I added it to an inexpensive Ikea charger, and love the way it spruces up my holiday décor. Add this decal to a mirror, a wall, a glass frame, your entryway...seriously, the possibilities are endless! You must mention that you'd like this freebie when you order! Just ask for the "Day 5 Merry Christmas decal" in the comments section of your order. That way, we'll know to include it! And, remember, shipping in the US is free if you spend $50 or more!